Robert Campin is generally accepted (but not universally) as the painter who was previously identified as "The Master of Flémalle." Born c. 1380 Campin is considered to be one of the first artists to depict realistic interpretations of his painted subjects. 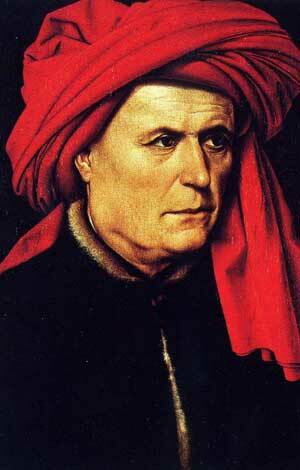 Along with his contemporary, Jan van Eyck, he was also among the first to experiment with oil paints. Campin worked in the town of Tournai, on the southern border of Flanders and became a citizen of that town in 1410. It would appear that he held some civic office in Tournai but lost his post due to a scandal involving adultery and the keeping of a mistress. These misdemeanours, in addition to his involvement in political disturbances within the city, resulted in Campin being exiled for a year. However, due to the intervention on his behalf of Countess Jacqueline of Hainault, his punishment was reduced to a fine. The artistic styles of Robert Campin, Van der Weyden and Jan van Eyck are often intertwined making the attribution of works to these artists difficult. In particular distinguishing the paintings of Campin and Rogier still manages to create debate among some scholars to this day. The Mérode Altarpiece is a triptych whose three panels show, the donor and his wife, left panel, The Annunciation, middle panel, and St Joseph on the right panel. The mysterious figure of the donor in the left wing wears the badge of the town of Malines but his identity is unknown. 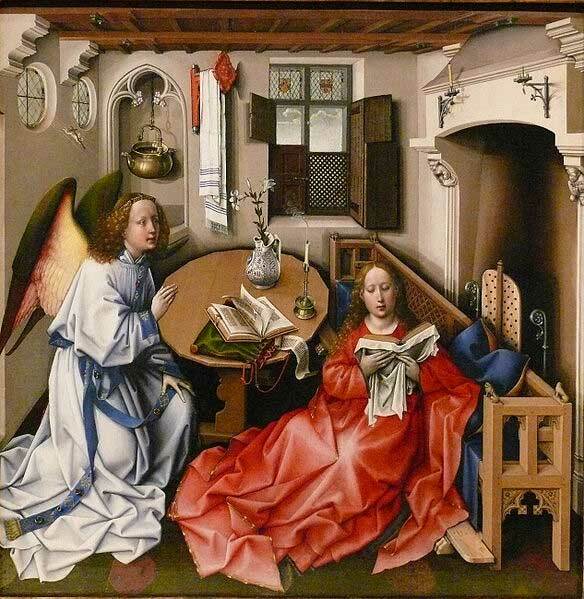 The central panel is a depiction of a middle-class room in which the Annunciation takes place. The settee which the Virgin leans against is typical of a style common in the Netherlands but the room is filled with the religious symbolism associated with this event. The lilies in the vase symbolise Mary's virginity. The scroll and the book represent the Old and the New Testaments. The room is lit by rays of sunlight at the top left of the painting, a miniature crucified Christ is carried on one of them and is about to enter the Virgin's body. The light is focused on Mary's dress forming a star shape, a possible foretelling of the star of Bethlehem. The right panel portrays St Joseph working as a carpenter, he has made a mousetrap evoking an idea by St Augustine that Satan is trapped and defeated in a blood-bated snare within the Passion of Christ. The "Virgin and Child before a Firescreen" also known as the "Salting Madonna," (named after its last private owner, George Salting) is a view of the Virgin set within a typical Netherlandish household complete with a detailed Flemish vista through the open window. This is a domestic scene, the Madonna is a well-fed mother who is about to feed her child. She sits on a bench that is also representative of a throne. The plated firescreen behind the Virgin's head provides a halo, this and the chalice close to her left arm are reminders of the religious subject of the painting. Robert Campin's portraits of a man and woman are much more realistically defined than his figures in the Salting Madonna and the Merode Altarpiece. They are reminiscent of the work of Jan van Eyck. These portraits highlight the artist's ability to paint the world as he saw it His ability to catch the facial expression of the sitters (probably man and wife) had never before been captured with such delicate character. The centre panel of this Triptych has been lost. 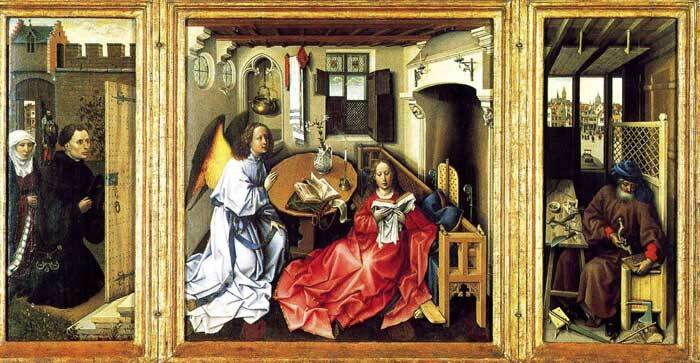 In the right panel, St Barbara sits reading her book within a middle-class room so typical of Campin. An open fire heats the room from behind the Saint who sits on a bench common in Campin's paintings. St Barbara's green dress is in stark contrast to the red cushions on the bench, above the fireplace, a detailed sculpture of the Trinity can be seen. The left panel features St John and the donor Heinrich von Werl who is placed prominently in front of St John. In a clear reference to the work of van Eyck, a convex mirror reflects the scene back into the room. Both panels feature windows that show views of the landscape in the distance. 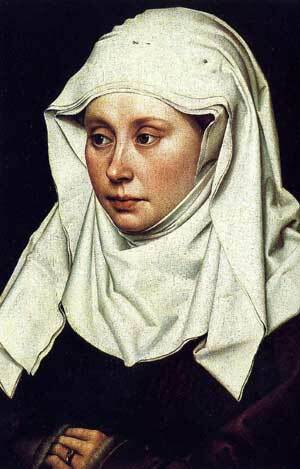 Robert Campin died in Tourni on 26 April 1444.